There's a room in my old bungalow with high ceilings and extremely inadequate lighting. 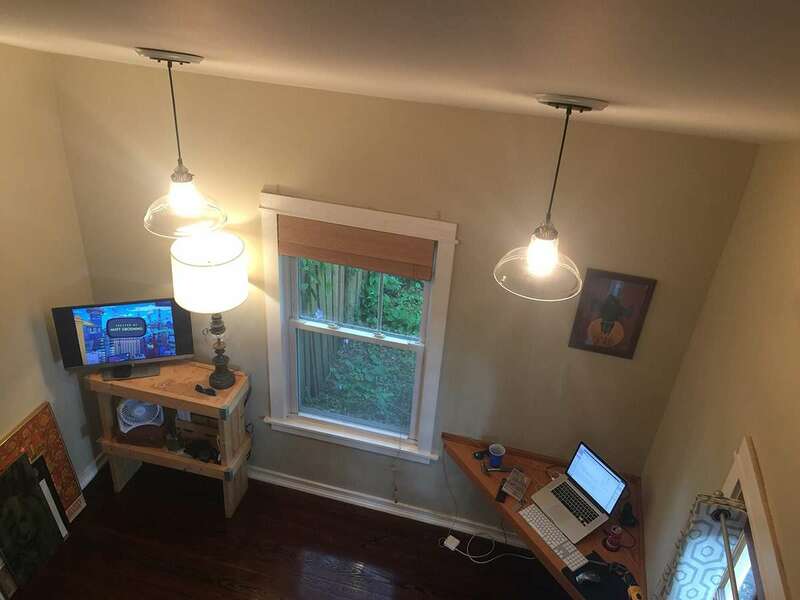 I use this room as an office, and it has a small loft, so the current lighting doesn't cut it. 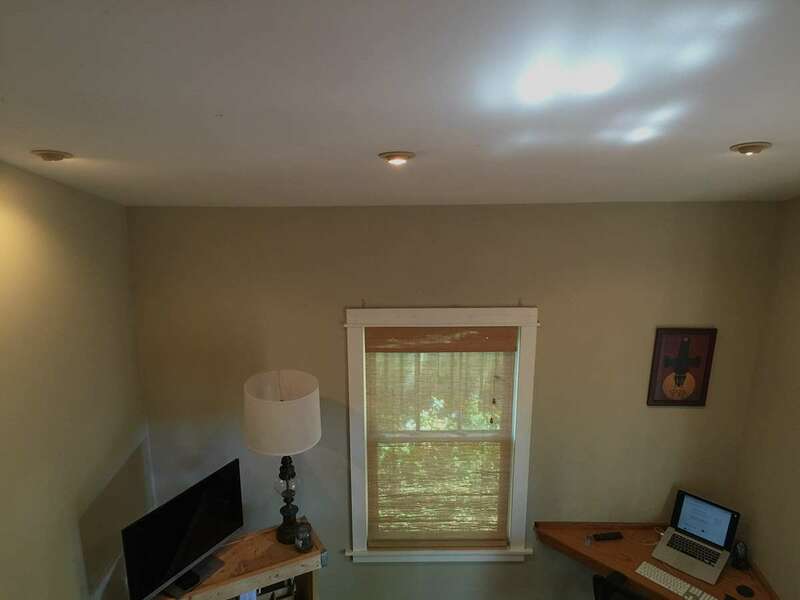 This room came with three recessed "can" lights that fit bulbs with a maximum wattage of just 40W. They were very '80s and yellowing eyeball-style lights. I decided to replace these lights with some hanging glass pendant shades that allow light to travel to the ceiling, maximizing light output while maintaining a cool '20s feel. 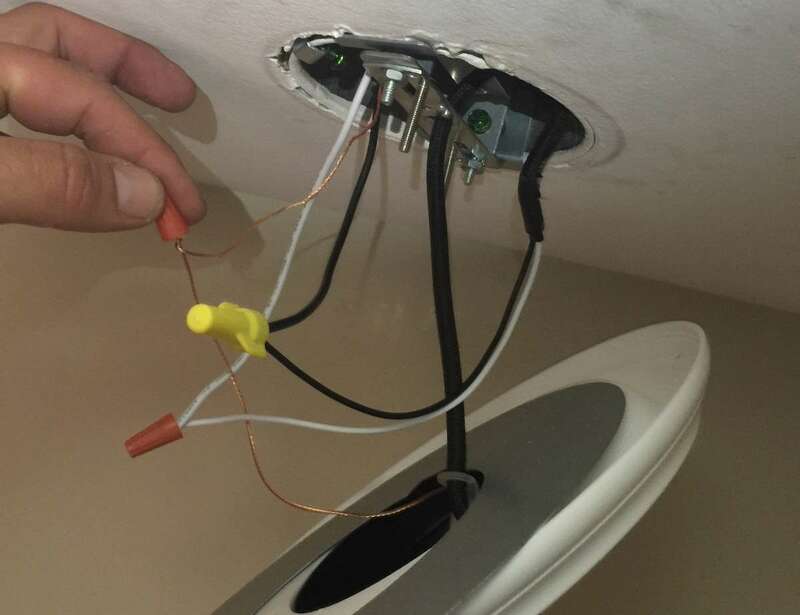 In this guide, I'll show you how easy it is to upgrade your recessed ceiling can lights to hanging pendant lights. This is the "before" shot: a bleak and dreary 40W existence. It doesn't look that dim in the photo, but such is the black magic of cameras. 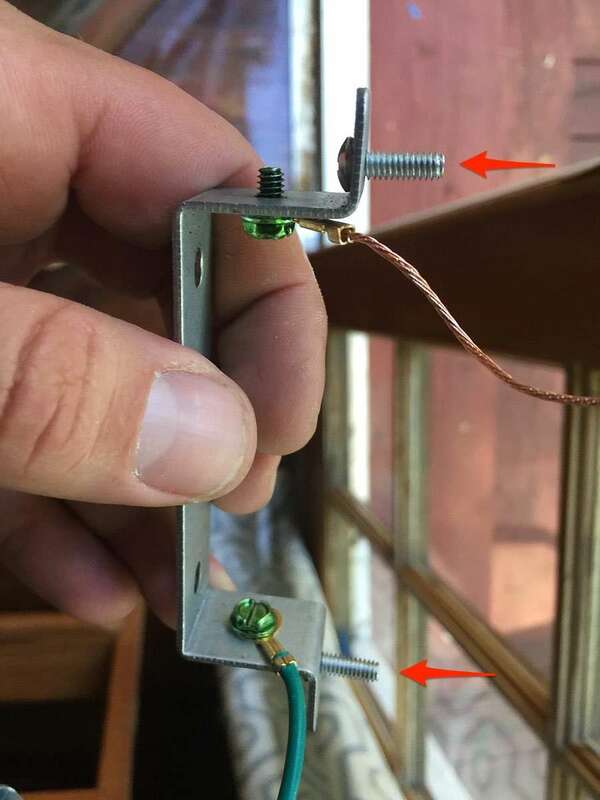 Do this from your breaker panel. From here on out, you're going to need a flashlight or, preferably, a headlamp. You can also run an extension cord from another room with a light. 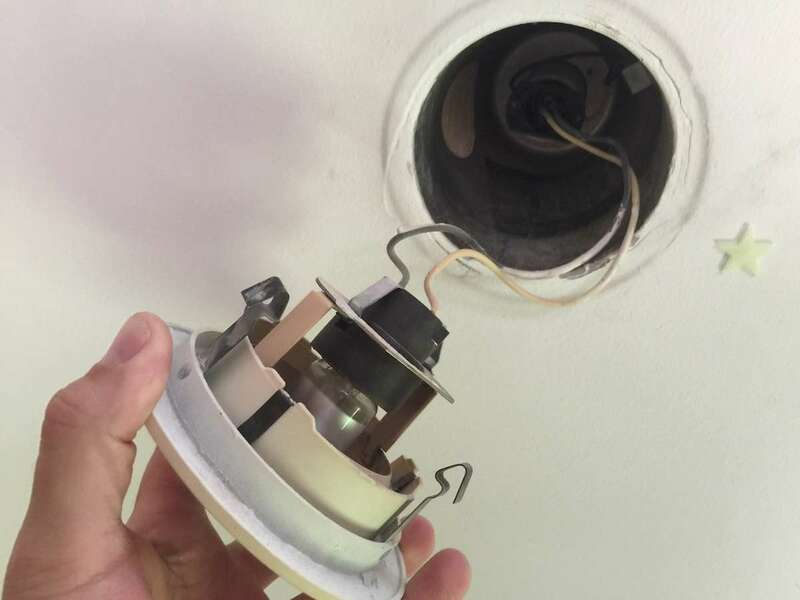 It's advisable to use a multimeter, if you have one, to check for the existence of electricity; even if you verify the power is off by trying to turn the lights on, there are other live wires that often run through your ceiling and may be adjacent to the ceiling cans. This will vary by fixture, but most units pull right out. 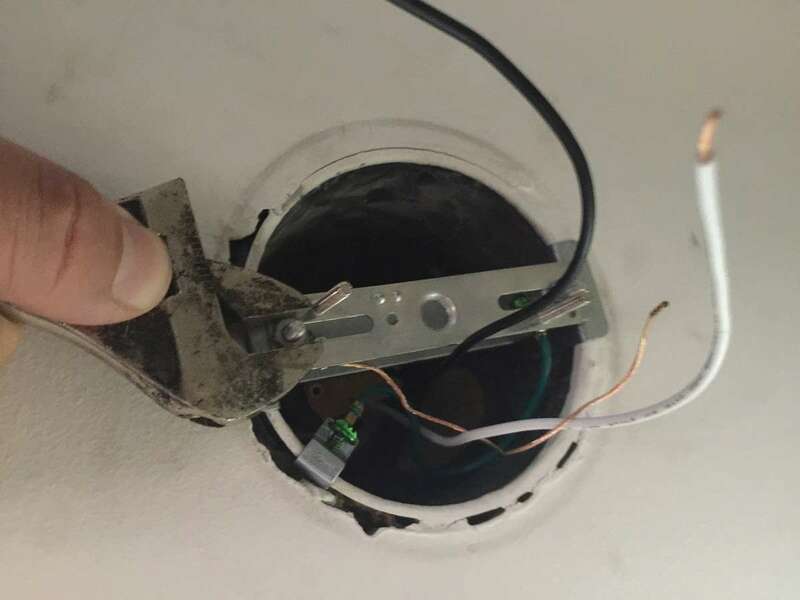 Mine pulled right out and was fully disconnected by unscrewing a standard lightbulb connector that was screwed into the recessed can's bulb outlet. I don't know how that star got there. Your pendant light will come with a mounting bracket, similar to the one you'll find above any ceiling fan or lighting fixture. 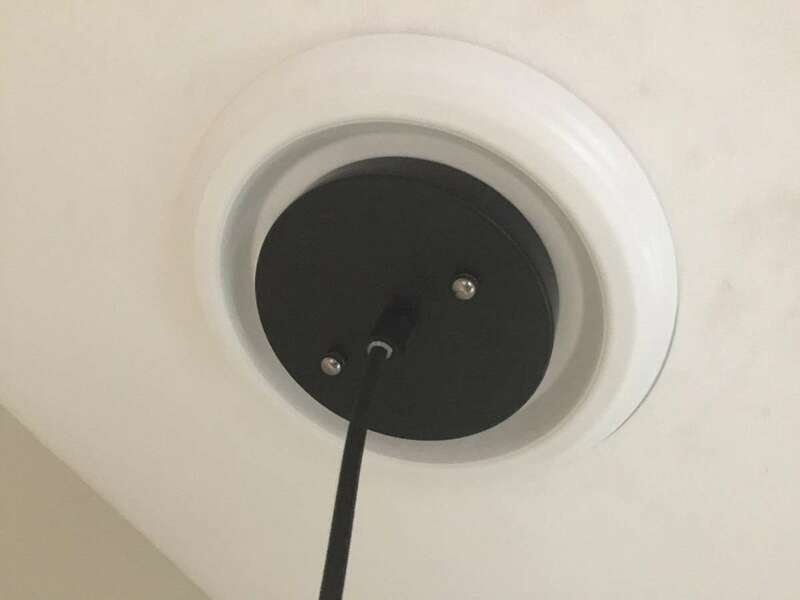 But since most recessed ceiling cans don't come preinstalled with mounting points (holes) for attaching our light mounting bracket, we're going to use a conversion kit. These kits are great -- they essentially allow us to tap into the existing can without the need to remove it from the ceiling. Install the conversion kit per the manufacturer's instructions. 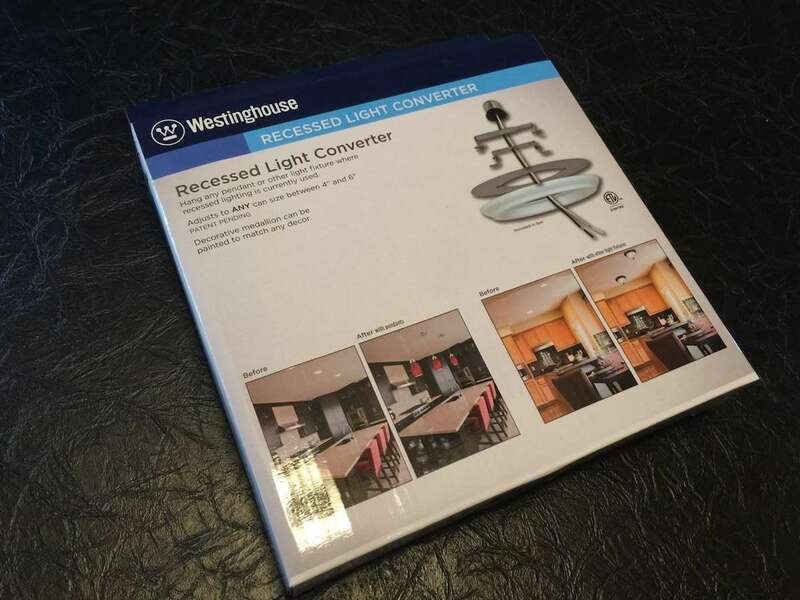 I'll guide you through the use of the Westinghouse Recessed Light Converter (P/N 0101100), which I've linked to at the top of this guide. 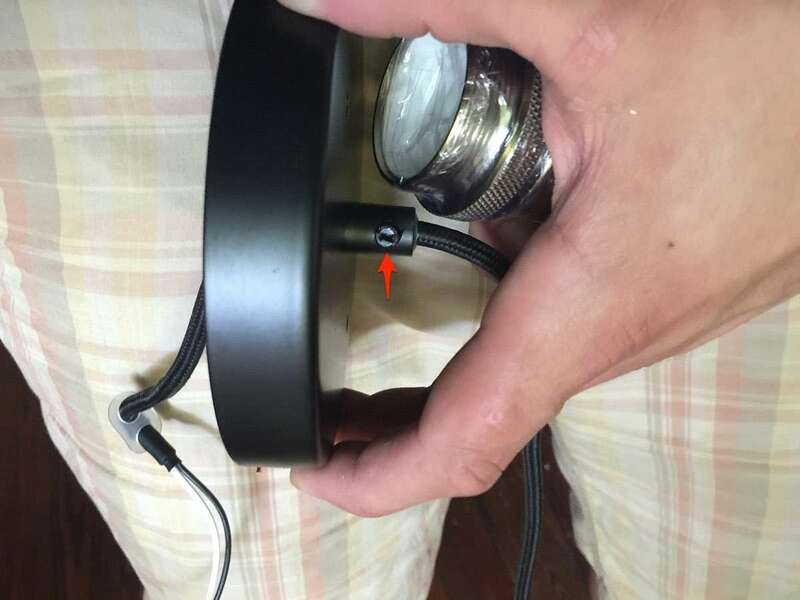 Screw in the bulb socket adapter. Then, using two sheet metal screws and your favorite cordless drill/driver, mount the adjustable bar to the can housing. You can make things easier by drilling two small pilot holes before driving the sheet metal screws in. There's a small bar that slides inside of the adapter you've just attached. This is the bar that the mounting bracket will attach to. Loosen the center screw, center the bar, and then tighten the screw. 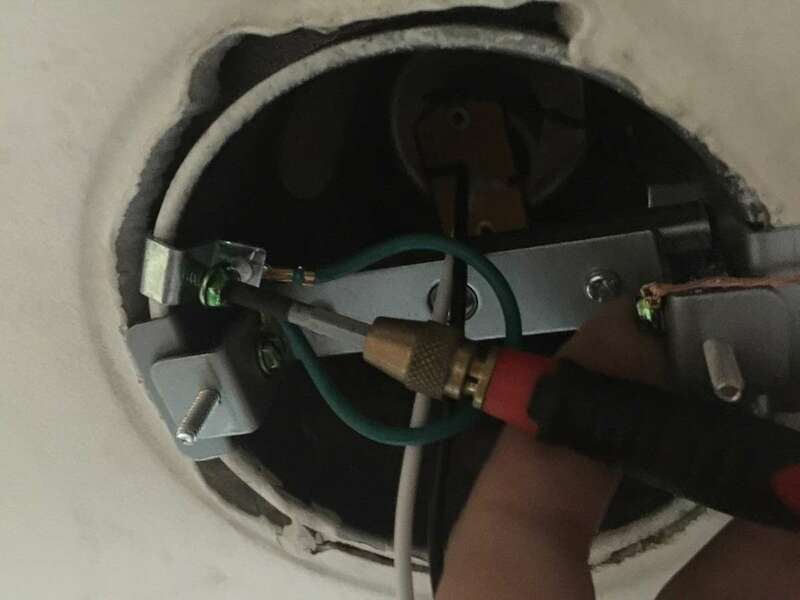 This will ensure that your lighting fixture is centered. Attach the two included fixture mounting screws. If you forget to do this, you'll have to take the mounting bracket off and reattach it. The kit also comes with a mounting bracket that you will attach the pendant light fixture to. Using two small machine screws, attach the mounting bracket to the adjustable bar. Use a thin flathead screwdriver to attach the grounding clamp to a clean, bare part of the lighting can. The cord on the hanging pendant light fixture is about 4ft long. Determine how tall you want it to be, and shorten it. 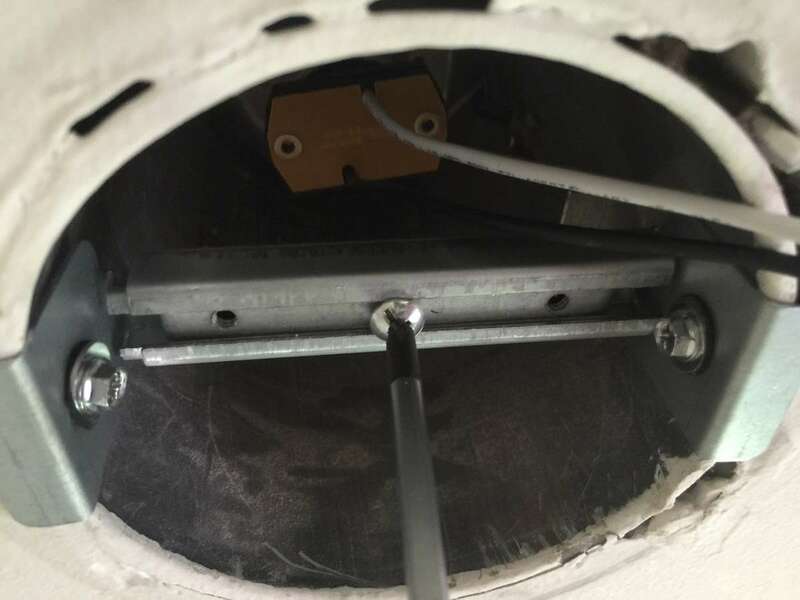 To do this, loosen the plastic set screw on the side of the fixture and slowly pull the cord through. You can either cut the excess cord off, or leave it on and coil it up in the can (in case you want to adjust the height later). Then, retighten the set screw. If you let the plastic set screw fall out and get lost, you're gonna have a bad time. The pendant light comes with yet another bracket that will attach to the pendant's base. 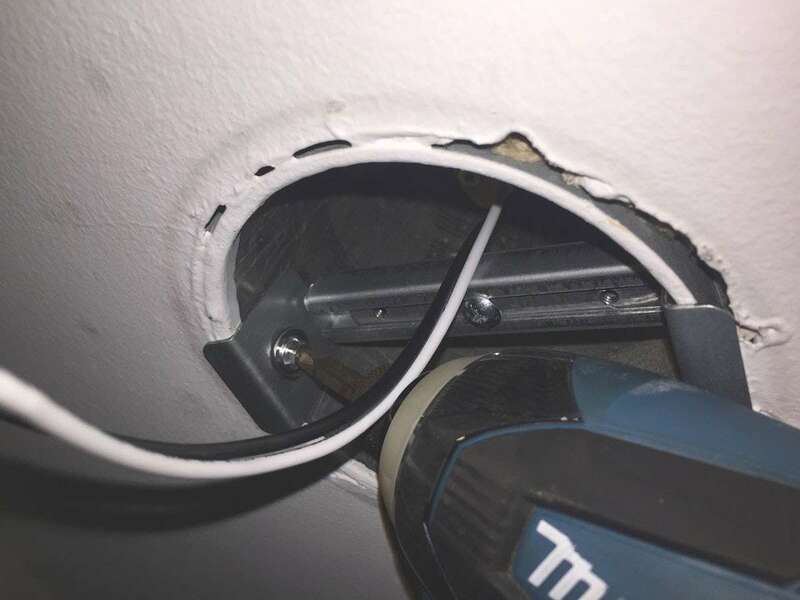 Use two nuts to attach the pendant's bracket to the ceiling mounting bracket. The conversion kit comes with a decorative medallion that covers the ceiling hole and brackets quite nicely. 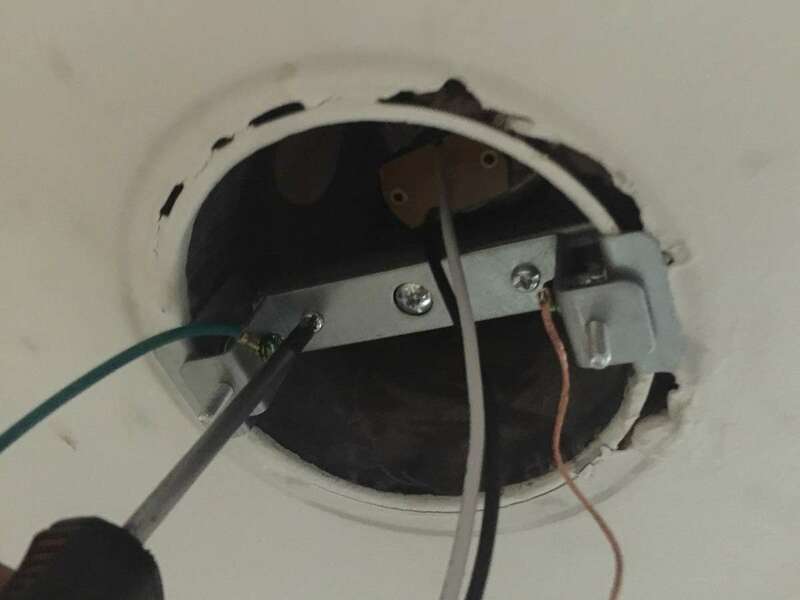 Hold the medallion to the ceiling , thread the light fixture wires through the bracket, and attach the wires using the included wire nuts (black to black, white to white, copper to copper). To use a wire nut, first twist two wires together (clockwise) and then screw the wire nut on (also clockwise). Use the two included decorative nuts to secure the pendant to the ceiling. 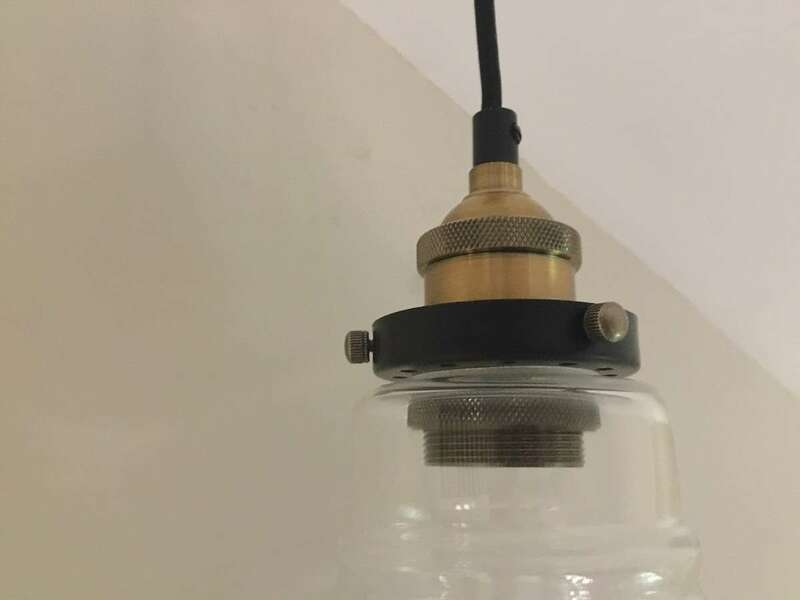 Attach the glass pendant shade to the hanging fixture using the supplied adapter. 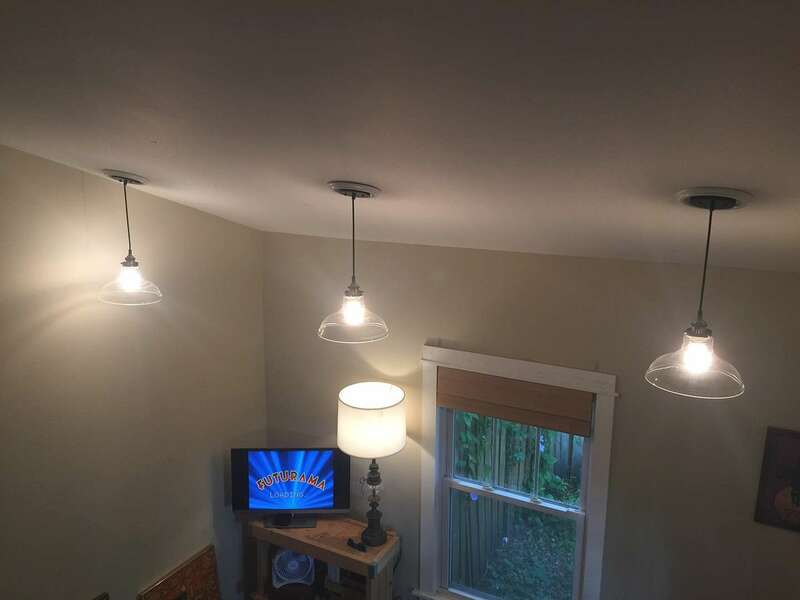 Turn the power back on, attach your favorite bulbs, and you're all done!